For some reason, my family and I are driving from Louisville, KY to Edison, NJ and beyond over the next two days. So being a child of the Information Age, I use Google Maps to find my way across America. Just so happens that we have decided to stop in Bedford, PA for tomorrow night's lodging. Google Maps, in an apparent fit of concealed wisdom, has added a one hour detour to its route for us. MapQuest seems to have no problem sending me through what may be dangerous territory. So against better judgment, I will use MapQuest for part of my journey tomorrow. But here is the thing - I pick and choose based on what I wish to believe. What strikes me about this is how this simply choice mirrors the way the American Jews pick and choose today. 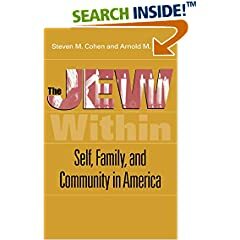 In Steve Cohen and Arnold Eisen's book "The Jew Within", they identify a trend in the way that moderately affiliated Jews behave, namely that the self is the Sovereign that guides them as they live their Jewish lives. The choose what they do today for personal reasons, and may choose tomorrow to do the same or to do differently, based on changing circumstances or moods. Recently, I was visited by an acquaintance from another Midwestern city. He was debating on coming to Louisville for Shavuot (The Feast of Weeks) for the all night learning session or coming the next day before Shabbat (which would make him fly on a Yom Tov, a day when observant Jews do not normally fly). In addition, this person who was into the all night learning that night, and keeps Shabbat, was picked up for a pre-wedding gathering on Shabbat afternoon. He admitted to us that he keeps Shabbat, but weddings are a time when he finds himself breaking Shabbat. I mention this not to criticize but to illustrate the point that this individual, who is a serious and committed Jewish by many standards, still does as he pleases. 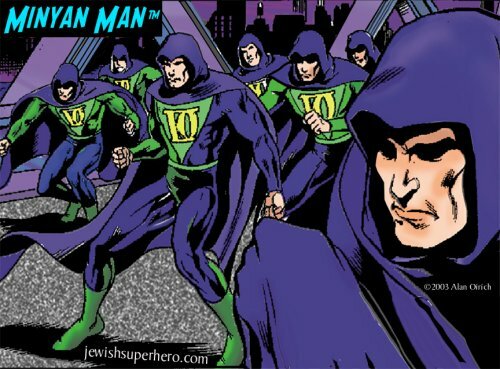 I think that Cohen and Eisen's idea of the Sovereign Self goes beyond the moderately affiliated. In American, all Jews are in some sense Jews by choice. What we do, we do because we choose to do so, not because we are commanded. Perhaps, even those who feel commanded, choose to feel commanded. The Rabbis debate which is better: to do when commanded or to do when not commanded. In American thinking, where individual freedom is valued very highly, people would probably say that it is better to do when not commanded. But the Rabbis see it another way: To do something when asked by someone else is a higher level of doing. In other words, doing the commandments for the Rabbis is all about being in relationship with God and acting out of loyalty to that relationship, which is called "commandedness." I wonder for how many Jews today their "doing of the commandments" stems from their relationship with God? Perhaps it does not matter. in the doing, for whatever reason, people catch a glimpse of the divine, a spark of holiness in their lives. Perhaps they will catch on fire (in a metaphorical sense) and their relationship to the Divine will grow, increasing their sense of commandedness as they seek out that feeling, that sense of the Holy once again. That would be a real going back to the beginning, where everything began. Not the East Coast, but to the Root of All, the One. Four years ago, I learned about this company from my synagogue. They provide easy-to-use materials for building quality, durable sukkot. They can provide directions, materials and a lumber list for wooden sukkot, PVC sukkah kits, bamboo mats for skhakh, great tarp walls, beautiful contemporary decorations, and even plastic fruits and vegetables. You can even order your lulav and etrog from them. So next year, build a sukkah! Tonight begins the festival of Sukkot, during which many Jews spend as much time as possible (mainly meals) in a sukkah, a small wooden hut that they build in their yard. Not that I want to promote stereotypes, but Sukkot is one of the few times a year that I use powertools. In fact all of my serious tools have been purchases related to building our sukkah. So yesterday, it was natural that I made a short trip to our local Home Depot for a couple of sukkot related purchases: some dowels for a sukkah banner, a new light buld for our deck to provide light for the sukkah and screening material so that someone in the kitchen can hear someone in the sukkah. I secured the bulb and dowels easily without any help from the staff. The screen had me a little lost. The first person I turn to is happy to walk me to the screen area to find the screen guy. 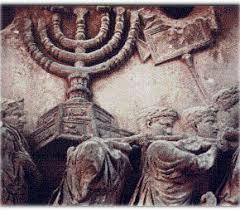 Surely he noticed by light grey leather kippah with two shiny silver clips keeping it one my head. And the knit purple and white kippah with pink clips on my daughter's head. As we are walking, he quietly says to me, "It's nice to see a person of faith in the store." In my head, all kinds of alarms go off, possible responses, the myriad ways that my faith and his differ on so many points. And I nod my head and say, "Thank you." Not worth getting into any deeper discussion than that. This is after all Home Depot, not an interfaith dialogue. But how interesting this man's view of his work life might be. Does it seem to him that so much of the world is secular? Do his customers seem particularly profane? Do few overtly devout people fix up their homes with help from Home Depot. I'm not sure, but I am sure that the kippot were the big give away. The comforting thing is that the remark was positive in that we both share a strong connection to our respective religion. Maybe we could have had a dialog on some religious values that we both hold dear. So he walks me to the screen guy, who shows me (to my chagrin) how to fix the screen with some screen materials and a nifty new tools called a spliner or something like that. As we are walking away together, my fix-it materials in hand, he asks me (again the kippah must be the tip off), "I see you are wearing one of those things on your head. I have seen a lot of people wearing those today. Why today?" After my short explanation about sukkot, its agricultural and historical significance, I explain that one of the main things on Sukkot is to build a "sukkah." The thing that I realized is that he had seen several people yesterday purchasing various supplies for a mysterious light building project, but had not gone up to them to ask. Maybe I was the guy with the thing on his head that was the tipping point for his curiosity. Part of me thinks that it may be that I was the most "normal" looking person with the thing on his head. Some of the other people he saw no doubt were from our local Lubavitch/Orthodox community. Maybe he found them a tad intimidating. Maybe I was the only one that was looking for some screen material. But it just goes to show you: wearing that thing, that kippah on my head brings people to talk to me about myself, Judaism, to share with me matters of faith, even if just to share that we each have a strong connection to one. And since Sukkot is a festival with universalist themes, it is appropriate that preparing for it made the world a little smaller and a little closer together.